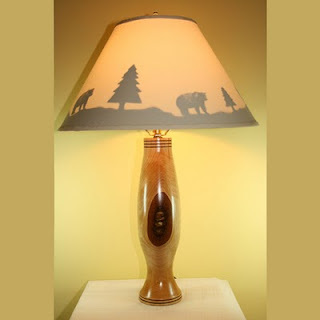 This bear silhouette shade lamp would look awesome in a log home, a summer or winter camp, or any home with a nature theme. The base is made of a yellow birch tree that my father cut down on his property in Western Vertmont. 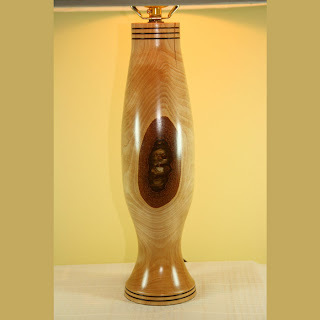 After drying the wood, it was turned on a lathe. The dark circle in the middle is part of the bark. It has three coats of polyurthane. The brown cord measures 6 foot, and there is a push switch socket. The hardback creamy-white fabric shade features a hand cut silhouette applied to the inside of the shade and only shows when the light is in on. The shade measures T-6", B-15", H-9". The lamp measures 22-1/2" tall and is for sale on my website at http://www.shades-etc.com/silhouette.htm.